This ZIP file can be downloaded here: SDKSamples.zip. Please note that all of the samples in the ZIP file are intended for use in Visual Studio 2015 and using .NET 4.5.1 where applicable. Furthermore, we have a a diagnostic sample that can be used to ensure your dev/client environment is setup correctly. First, make sure the latest DYMO Label software is installed. It is always available on DYMO web-site, at the time of writing it is version 8.3.1. The easiest way to print QR-code is to use built-in support for QR-code in DYMO Label Framework. First, design your label using DYMO Label software. Unfortunately, DYMO Label itself does not have ability to specify QR-code barcode type in the UI yet. So, add the Barcode object to the label and put it into desired position. Don’t specify the barcode symbology, use the default Code39. Save the label in to a file, open the file in any XML editor and change thetag to “QRCode”. First, we check that the label is loaded and the printer is selected. Next, the barcode data is set to be the blog’s URL. And finally, the label is printed. Printing QR-code by using Barcode object is easy. The only drawback, it is hard to control the actual barcode size. tag can be used for that but it support only three predefined sizes Small/Medium/Large, but still the overall size will depend on the actual barcode data. The longer the data string, the larger is the barcode. So, the idea is to use some library to generate QR-code image of desired size, and then print it using the Image object. As before, design a label using DYMO Label software. Put an Image object on the label where the barcode should be printed. Set the Image objet size to the desired barcode size. When specifying the barcode image size in pixels calculate it based on the printer resolution, that is 300 dpi for LabelWriter printers and 180 dpi for Tape printers. For example, if you want the barcode to be 1” in size, specify the barcode image size as 300×300 pixels. See BarcodeAsImage.label from the sample project. Image object accepts image data as a string that contains base64-encoded png stream. The question is, how to get/generate this string. Again, there are several ways of doing that. One way is to generate QR-code image on the server using some library. Then encode the image using base64 and return it to the client as a string. Finally, on the client side, call setObjectText on the Image object and print. In the sample, we just request “qr.base64” resource that contains precalculated QR-code image for “http://developers.dymo.com”. In real application, you will probably pass the data to be encoded as a resource parameter. 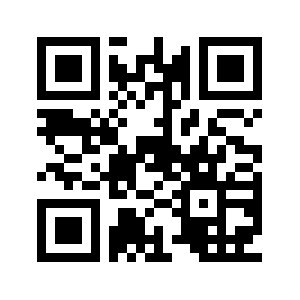 Generate QR-code image on the server-side and base64-encode it on the client-side. Base64-encoded strings are larger then binary png data. So, to reduce network traffic, we can return original png data from the server and base64-encode it on the client. To encode the data we will create , render our image on it, and then get encoded data using canvas.toDataURL() method. Note: image loading is asynchronous process. So, we can’t just assign img.src property and immediately draw it on a canvas; we have to wait until the image is loaded completely from the server. To handle that, we do main work in onload handler. also, toDataURL returns data url, to get the data itself, we have to remove the url prefix. Again, as in the previous case, qr.png resource contains recalculated QR-code image for “http://developers.dymo.com”. In real application, you will probably pass the data to be encoded as a resource parameter. A drawback of this method is that it requires support in the browser. All major browsers already support it, but be aware that in Internet Explorer it is supported starting from version 9 only. Update (2011-12-20): works in Firefox 9 as well. The code is very similar to the previous example. The only difference is that we set img.crossOrigin property and we use Google’s Infographics API to generate the qr-code image. Notice that in this example the image is generated dynamically, and barcode data is passed as the part of the url. It is quite simple to print QR-code barcode even if built-in support is somewhat limited. This blog post will demonstrate how it is easy to print a label with a QR-code barcode from any .NET application. Even more, it will show how to do that in two different ways. The sample VS 2008 project is available here. First, make sure the latest DYMO Label software is installed. It is always available on DYMO web-site, at the time of writing it is version 8.3.1. Next, in Visual Studio create a new .NET project and add a reference to DYMO.Label.Framework assembly. This will make possible to use DYMO Label Framework API in the project. The easiest way to print QR-code is to use built-in support for QR-code in DYMO Label Framework. First, design your label using DYMO Label software. Unfortunately, DYMO Label itself does not have ability to specify QR-code barcode type in the UI yet. So, add the Barcode object to the label and put it into desired position. Don’t specify the barcode symbology, use the default Code39. Save the label in to a file, open the file in any XML editor and change the <Type> tag to “QRCode”. First, label is loaded from a file, stored as a resource in the application assembly. Next, the barcode data is set to be the blog’s URL. And finally, the label is printed on the printer selected in the UI. Printing QR-code by using Barcode object is easy. The only drawback, it is hard to control the actual barcode size. <Size> tag can be used for that but it support only three predefined sizes Small/Medium/Large, but still the overall size will depend on the actual barcode data. The longer the data string, the larger is the barcode. So, the idea is to use some library to generate QR-code image of desired size, and then print it using the Image object. As before, design a label using DYMO Label software. Put an Image object on the label where the barcode should be printed. Set the Image’s Scale Mode to None to avoid image scaling and possible problems with the scanning/reading of the printed barcode. See BarcodeAsImage.label from the sample project. Then use selected library to generate the QR-code image. When specifying the barcode image size in pixels calculate it based on the printer resolution, that is 300 dpi for LabelWriter printers and 180 dpi for Tape printers. For example, if you want the barcode to be 1” in size, specify the barcode image size as 300×300 pixels. Actuals API calls are very similar to the first case. First, label is loaded from a file, stored as a resource in the application assembly. Next, the barcode image is “generated”; for the simplicity, already created png file is used instead of library calls. Next, the image data is assigned to the Image object. And finally, the label is printed on the printer selected in the UI. 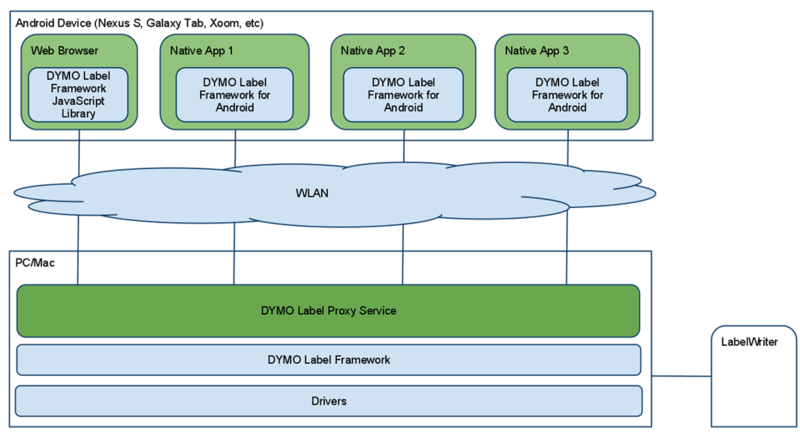 We are proud to announce a BETA release of the DYMO Label Mobile SDK for Android. The DYMO Label Mobile SDK for Android is a complete toolset containing libraries, documentation, and samples that make it easy to add label printing to any Android app. All DYMO LabelWriter and DYMO LabelManager printers are supported. Using the DYMO Label Mobile SDK in combination with DYMO Label Web SDK allows creating both native and web-based apps for Android. This release is a BETA and is not supported by DYMO. It has not been extensively tested outside DYMO and should be used for developer testing only, NOT for production software releases. It is essentially the same as the architecture of DYMO Label Mobile SDK for iOS. The major piece here is a computer that has a DYMO printer plugged-in and DYMO Label software installed. DYMO Label software contains a service called DYMO Label Proxy that allows communication between an Android device and the printer. 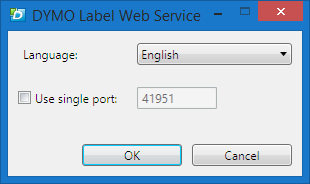 right now DYMO Label Proxy is available for Windows only. So, a printer must be connected to a Windows machine, or be available from Windows machine that has DYMO Label Proxy installed (see below). the printer itself does not have to be connected directly to the computer running DYMO Label Proxy. The printer has to be ACCESSIBLE from that machine. This means that the printer might be really connected to a different machine and be a “shared” network printer. Or the printer might be connected to a DYMO Print Server and be “installed” on the computer using a RAW TCP/IP port. This setup might be used to simplify installation (see below). the local network is used for communications between the proxy service and the mobile device. That means that on the mobile device the Wi-Fi should be turned on and the device should be connected to the network. Using just 3G is not enough. docs – SDK documentation. Contains API reference documentation in JavaDoc format. libs – jars to be included with an application. Samples were tested with Eclipse Helios and Android SDK r11. The SDK supports Android API level 8 (2.2) and later. DYMO Label Software will configure Windows Firewall to open the port 8631 for inbound requests. If a different firewall software is installed, you have to configure it manually. The port number may be changed from the default one. Either use the configuration utility included or specify the port manually in the service’s application .config file. In any case don’t forget to update the firewall rules to open the port. Otherwise clients will not be able to connect to the service. The final release to the public will add the ability to select the port number and autostart options for the service during installation. Note: This version of DYMO Label Proxy contains enchantments and bug fixes over the version released for Web and iOS SDKs. To be able to use with Android SDK you must update it to the latest version. To configure the service use DYMOLabelProxyServiceConfiguration.exe utility. It lets you change the port number the service is listening to as well as stop/start/restart the service. In addition the utility displays a list of urls that might be used to connect to the service. To change the port number enter a new value into “Port Number” field and click “Apply” button. Right now the service is not restarted automatically, so don’t forget to restart it. You can start/stop/restart the service from within the configuration utility. Alternatively the standard “Services” panel of the “Computer Management” tool can be used. In this case it is necessary to know the service’s ip-address to be able to connect to it from the Android device (see below). The configuration utility can help here as well. Service’s ip-address(es) is displayed in Service URIs list. Note: these tasks might be performed in a different order, e.g. printer discovery might be performed after the label is prepared for the printing. Though usually printer discovery should be performed first, because it can take some time. All SDK classes and interfaces are accessed from a top label Framework object. A constructor of Framework class accept Context as a parameter. The context might be either an activity/service or be the application context. The Framework instance can be created inside activity’s onCreate() handler. Note, that Framework initialization might take some time; so if the activity ca be frequently recreated or if the Framework should be accessed from different activities, it make sense to use some sort of singleton to make sure only one instance of the Framework exists. Please note, the listener’s methods are called from a non-UI thread. So, if you need to perform any UI related operations that must be called from the UI thread, don’t forget to use Activity.runOnUiThread() or View.postDelayed() methods. Unlike iOS API there is no way to automatically determine when printer discovering should be stopped. It is important to stop it manually by calling stopRefreshPrinters()method. If stopRefreshPrinters() is not called this may lead to an extensive battery drain (underneath implementation uses Bonjour, that uses multicast network requests, and the requests use a lot of power). Call stopRefreshPrinters() after a timeout and when the activity is been stopped. 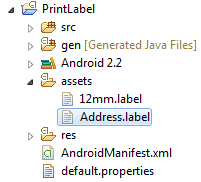 This assumes, that the Android project has “Address.label” file in the assets folder. Label Layout can already contain data to be printed, e.g. an address. this might be a case when a label is generated dynamically on the server. But usually we will need to set data programmatically based on user’s input. This can be done using two different methods. The first method allows printing of one label only. Use Label.setObjectText(String objectName, String objectText) method to set text data of Address, Text, Barcode, and CircularText objects. Use setObjectImage(String objectName, Bitmap image) to set image data for Image objects. The second method is more universal, and it allows printing multiple labels at once. It is implemented using a “label set” concept. Label set is similar to a recordset, a database table. Label set consist of a set of “label records”. Each label record represents data to be printed on one label. Label record itself is conceptually is a dictionary (associative array), where dictionary keys are label object names, and dictionary values are label object data. To manipulate a label set use LabelSet interface. Use addRecord method to add a record into a label set. To set object data in the record, use LabelSetRecord methods. There are methods to add text and image data similar to ones above. Also, there is way to specify formatted/styled text data where each character or line can have different formatting (font size and style). To create a LabelSet use Framework.createLabelSet() method. printer – printer to print the label on. The printer instance can be obtained from a list of available printers populated during printer discovering process described above. This is the only required parameter, all other can be omitted. printParams – printing parameters, like number of copies, print quality, etc. This parameter can be null, in witch case defaults will be used. labelSet – a label set contains data to be printed. If omitted, the data contained by label instance will be printed. This method call is asynchronous as well. Right after all necessary data are assembled the method returns. Printing progress monitoring can be done using PrintJob instance returned by the print() method (see below). The DymoLabelFramework internally uses some classes available only starting from Android SDK API level 8 (Android 2.2, Froyo). Make sure the project targets Android 2.2 or later. The SDK requires two permissions to be set in AndroidManifest.xml. The first is android.permission.INTERNET, so the SDK be communicate with the Proxy service. The second is android.permission.CHANGE_WIFI_MULTICAST_STATE that is required to be able to use Bonjour for printer discovering. Note: samples applications use another one, android.permission.ACCESS_NETWORK_STATE. It is uses to determine Wi-Fi status and ask a user to turn Wi-Fi on if necessary because otherwise no printers can be discovered. It is strictly to be a little bit more user-friendly, and is NOT required. Use Android SDK tools to generate/update initial build.xml file. Check Android SDK target version in default.properties file, so target=android-8 (or later). Specify path where the jars are located in build.properties by using jar.libs.dir property. E.g. for the sample projects jar.libs.dir=../../libs. Note: to compile sample projects from the command line you have to specify path to the Android SDK in the local.properties file by using sdk.dir property. DYMO Label Mobile SDK for Android provides a simple way to add label printing capabilities to any Android app. 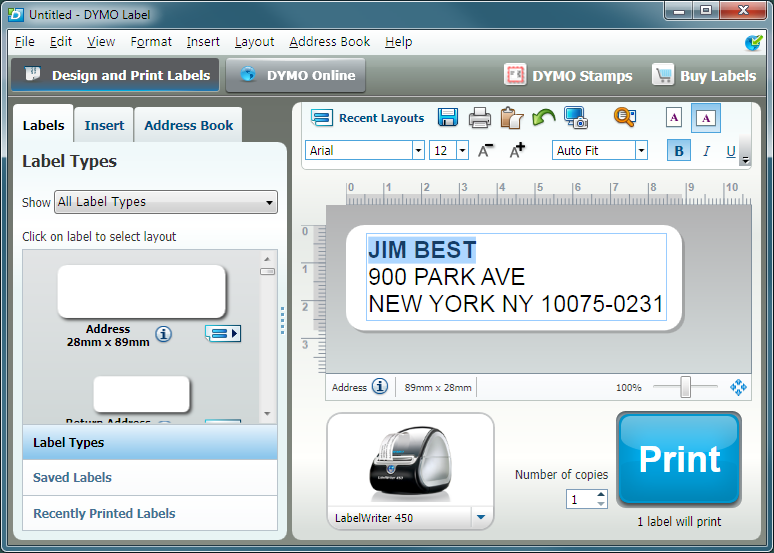 Along with DYMO Label Web SDK developers can use DYMO printers from their web-based applications or from native apps.